Great spot to have a casual dinner - BBQ it up! Cozy wood fireplace for ambiance and added heat. Wood is not provided. Oceansong Overlook @ Redwood National Park Beach is perfect for nature lovers looking for a rural setting bordering Redwood National & State Parks with all of the pristine beaches, rivers, redwoods, and hiking! 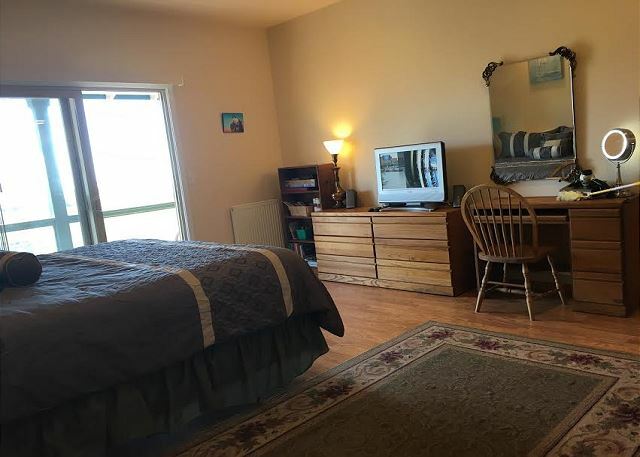 This home sleeps 4 comfortably featuring a master suite with it's own full bath and King bed; a 2nd full bath; a loft off the the living room, with access via a ladder with a handrail, to the Queen bed; a nice size living room with a 60 inch flat-screen TV and a full kitchen as well. The wrap-around covered deck is great for relaxing after a day of exploring all the inviting parks, lagoons, rivers, and small towns. You can make some tasty meals out on the BBQ as well! This house is definitely not kid-proof so if you have young ones, you will have to keep an eye on them. This is the guest home on a larger property with is a second home where the caretakers live. They are super nice and are great for asking about things to do in the area. Bring your camera and binoculars! Oceansong Overlook is also a bird sanctuary and is home to migrating cliff, barn and tree swallows. Just as they flock to the famous Mission in San Juan Capistrano, these tiny birds travel thousands of miles every year to nest on the upper eaves of this home to build their own mud townhouses. This location is a bird watching paradise! Osprey and Peregrine falcons nest on the hill behind the house, egrets, herons and ducks in the wetlands below. Bald eagles soar in from up river and the song birds, hummingbrds and shore birds are too numerous to name. Bring your bicycles and ride or hike to the beach, which is about a 10-minute walk from the home. Walk along the Redwood Creek Levy with the river on one side and farmlands on the other. The river and wetlands are literally right out the door and you will see an amazing range of migrating birds and wildlife. The air is filled with the sounds of nature here: frogs, ocean and birdsong! In fact, the name of the town, “Orick” is the local Native American Yurok word for the sound that frogs make (say the word and it sounds like a frog croaking). 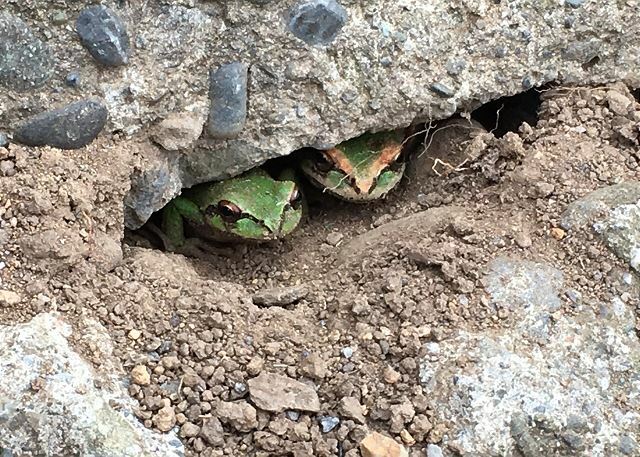 You will see tree frogs and red-legged frogs around the property as well - cute little guys. And for the water lovers, what a paradise! The local lagoons offer great fishing, kayaking (you can rent kayaks at Stone Lagoon through Kayak Zak’s), canoeing, Stand Up Paddle Boarding, Surf fishing, boating and sailing. There are two horseback ride companies and one bike rental in Orick plus several tour operators including Redwood Adventures. 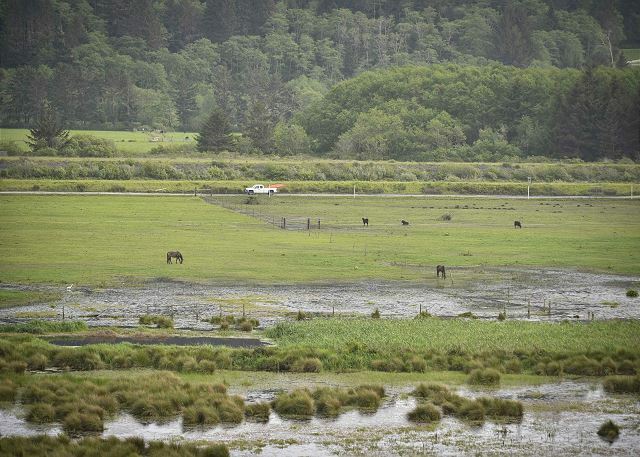 Fun annual events held locally include the Orick Rodeo every July, as well as the Yurok Tribe's Sumeg Village Day, a celebration of the local Native American culture held at nearby Patrick's Point State Park. You’ll want to drive slowly on the 1.7 mile paved road to Oceansong Overlook as the road winds through two farms and the scenery is breath-taking. Also, there are often wildlife (Roosevelt elk, deer, bear, skunks, frogs, foxes) on the road or that old donkey who is an expert escape artist. Nellie gets out so often she has become the neighborhood donkey, but she is often blocking the road or brings her goat, horse or other livestock friends with her. Please note mid-October through January is duck hunting season and early morning gun shots may be heard. PLEAE NOTE - Winter and/or high rainy seasons may require higher elevated vehicles due to road flooding to and from the house. In extreme rain conditions, relocation may be required. We cannot guarantee in the same area. Some price adjustment may be necessary when moving to different homes. Nice spot for exploring the Redwoods, Beautiful, little used beach a few minutes away. Porch has 180 view of Redwood ridge, pastures, estuary and ocean. Thank you for leaving a review of the Oceansong Overlook. 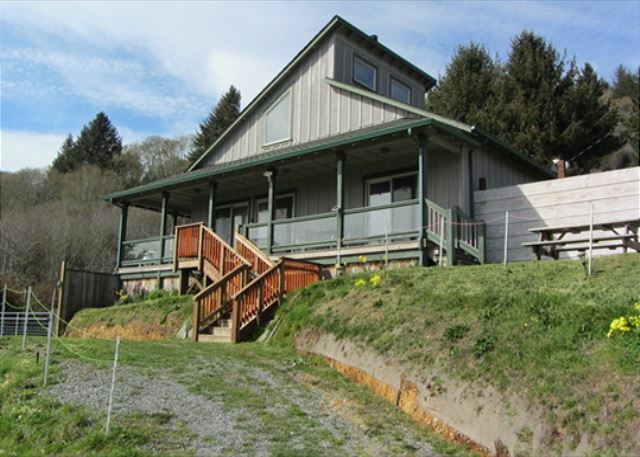 This home is a great spot for exploring the redwoods and is very enjoyable at the home, as well. Close beach and wonderful view. We are glad you enjoyed your stay and please look us up again if you ever decide to visit the redwoods again. Thank you for your recent stay at the Oceansong Overlook. We had a great time the house was great the area was beautiful. Would totally recommend this to friends and have! The Oceansong Overlook is a special place! Off the beaten path, but in such a beautiful area. Thank you for sharing you positive words and for recommending the home to others. We hop you will return to stay with us again for future vacations. The Oceansong Overlook is such a perfect place for visiting the redwoods and for relaxing at the end of the day after a day of hiking. The spectacular view is very unique, and the home is well equipped by the homeowners. We are glad you enjoyed your stay here and we hope you will stay with us again in the future for many more memories to come. We pulled up to OceanSong and couldn’t believe the picturesque location! It was such a welcome surprise to theee weary travelers:) The pasture below with hires grazing nd the oven in the background breaking on the shore, we took in a deep breath and sat on the deck to take it all in before unpacking. The house was better than expected. Beautiful! Nicely furnished and the kitchen well equipped. Having a washer and dryer was a plus:) beds were comfortable and we even tried the fold up bed and it was comfy as can be. We can’t wait to return! We found Dry Lagoon Beach where we enjoyed strolls and digging in the beach for agates md jasper:) Loved seeing the giant redwoods and watching the magnificent elk at Prarie Creek Campground. Beautiful view of the ocean, although there is a house next to the property, it really feels secluded and private. We loved this place and would recommend this to others. We went down to the beach (you can drive there) everyday, most of the time we were the only people there. We traveled all over California on our vacation, and this was our favorite spot! The Oceansong is quite the favorite amongst our guests that visit the Orick. Despite having an adjacent neighbor, it is very peaceful and private. the caretakers next door have also been very accommodating to any guests in need of anything. The View is amazing and the beach tends to be very empty always. Thank you for writing a review of this home and for making us a part of your vacation. We hope this means you will visit again some day. The location and home were ideal. 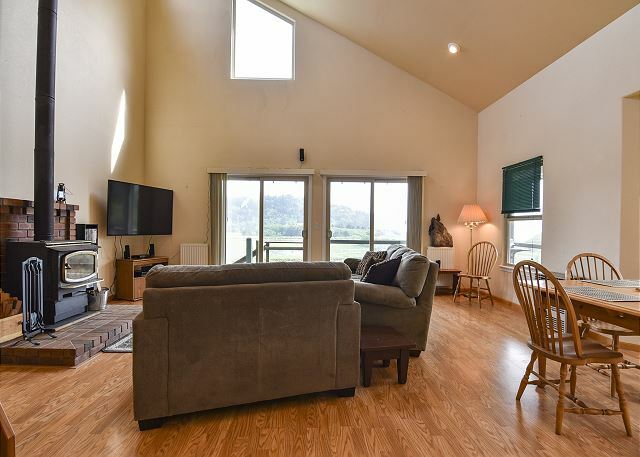 A private sanctuary with plenty of amenities Close to the Redwoods with spectacular coastal views and abundant wildlife. Thank you for sharing that your stay at the Oceansong Overlook was perfect in every way. This is a very special home. Wildlife, spectacular views, the nearby is just an ideal location and home for visiting our area. An overall wonderful stay! House eas clean, people were helpful, and the view was amazing, not to mention sunsets on the beach were breath-taking! In a great location for visiting multiple state parks within the Forest. Would definitely stay again. The Oceansong Overlook is a hidden gem. 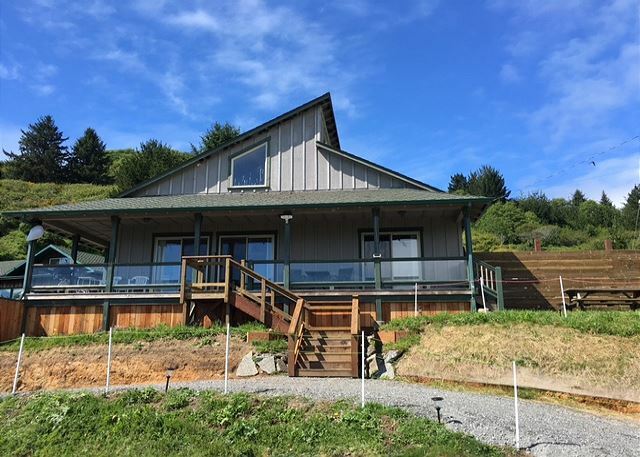 The view and the sunsets are breath-taking, and the home is a great location for visiting the redwoods. We definitely hope you will return to stay with us again. The property was just like on the photos. The only change I would do was adding description of a last mile before getting to house. After driving on narrow, one lane road ( with some big pot holes) we started to worried about how the house is going to be. But after getting up on describe parking area, house looked great. Property was very clean ( they have nesting swallow birds up in the eaves, so disregard mess related to birds). Great space in living room open to kitchen - well equipped for basic cooking. 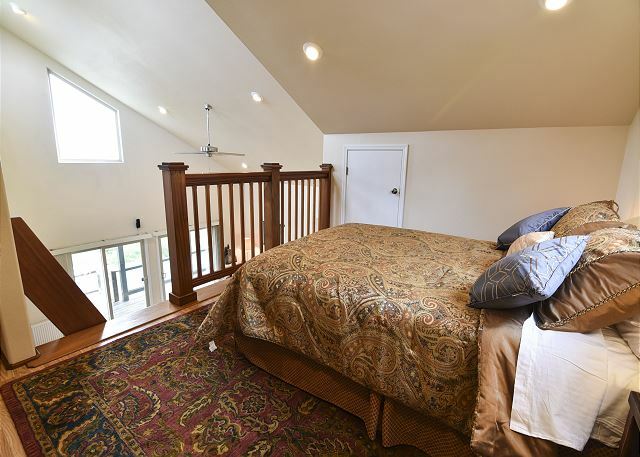 There were only 2 of us so we used master bedroom downstairs, but I can see that using upstairs bedroom would be tricky in the night walking down to bathroom( steep steps, more like a ladder). We had small issue with door lock but Mng was able to help with that and we felt very safe. House is at the end of the road, very quite ( except the birds :). View of the beach in the distance is very relaxing and peaceful. Location in Orick is right in the middle of all parks with redwoods and we really enjoyed being that close - it allowed us to go north and south exploring but still close. Nice covered porch to sit outside and listen to the ocean. I would recommend this property for nature lovers and peaceful relaxing vacation. The Oceansong Overlook is a very unique home. Only one we have like it actually, with the bird refuge right there. It is quite a treat to watch and hear them at work. The road to the house IS a bit iffy at times, but as you mentioned, once there, the house is great and the views are spectacular. This is definitely a nature-lovers home, and thank you for appreciating it for what it is. thank you for sharing that you had a relaxing vacation, please visit us again soon. Thank you for choosing the Oceansong Overlook and for booking with Redwood Coast Vacation Rentals. I am glad the home met your standards and you had a nice getaway. We hope you will consider again for future stays to the area. The house is comfortable, modern, and has a great kitchen and living room area. We loved watching the wildlife from the fabulous view of the ocean and marsh. The drive into the property takes a few minutes on a small, curvy road with occasional potholes, but totally worth it and not a problem if you're not in a hurry. The OceanSong Overlook is definitely off the beaten path, but so worth it! This home has become quite a popular home with spectacular views and for birdwatchers, such a delight. Thank you for appreciating and enjoying this home. There were beds. I slept in them. Great place to stay. It was a nice short weekend getaway for my wife and I. It was a pleasure waking up to the sounds of chirping birds with the crashing of the waves on the shore from a far. Such a treat watching llamas grazing on the side yard along with quails, various wild birds, rabbits, chip monks feeding, The view from the balcony, living room and bedroom was awesome. The nearby beach at the end of the road was empty. We walked along the shoreline for a few miles with no one else on site in a Saturday morning. Incredible. Thanks for sharing your paradise. The Oceansong Overlook is definitely a bit of paradise! So much to love about being at this home, as you have listed, it's hard to know where to begin. An incredible place to spend a vacation and to have the beach all to yourself like that is a treat in itself. 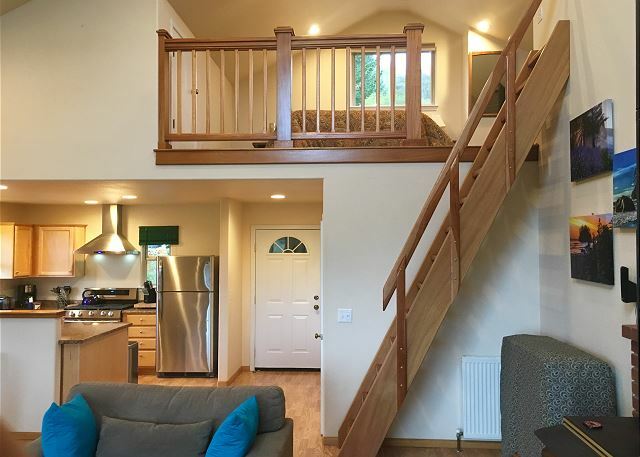 Thank you so much for choosing this home and for booking with Redwood Coast Vacation Rentals. Your review means so much to us. This is an idyllic place to use as a base for exploring the nearby parks. Thank you for your choosing the OceanSong Overlook for your vacation. We hope you will return to visit Redwood Coast Vacation Rentals again, for your future vacations. We rented this home as a base for exploring the redwoods with our two children, 4 and 7. The property was very well kept. The owner was friendly and helpful. I would definitely recommend this property for anyone looking for a quiet, peaceful vacation. The Oceansong rlook is a very unique property. It’s easy to feel far from civilization at this property, yet it’s only minutes to get to Highway 101. The scenery is breathtaking, and it being a bird refuge makes it a wonderful place for birdwatching. The view across the of the pasture in the distant ocean, make it hard to leave once there. 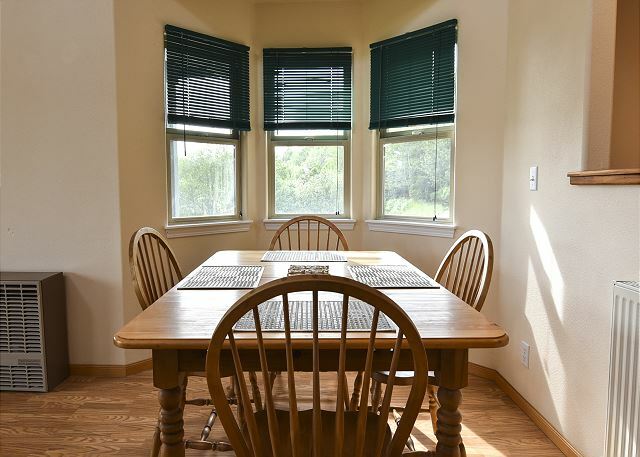 It is definitely the perfect home for anyone looking for a quiet, peaceful vacation. I am so glad you had a relaxing time here, and the home serve as a great base for you and your family for exploring the redwoods. We hope you’ll be back to visit us again someday soon. Our family needed a break from the long cold Alaska winter in a warm and sunny location. The redwoods and the coastline beckoned us to the small town of Orick. OceanSong Overlook was a perfect fit for us ...... super clean, modern, very comfortable, fantastic scenery, and very secure off the beaten path of Highway 101. We thoroughly enjoyed our stay at OceanSong and do highly recommend it for others. 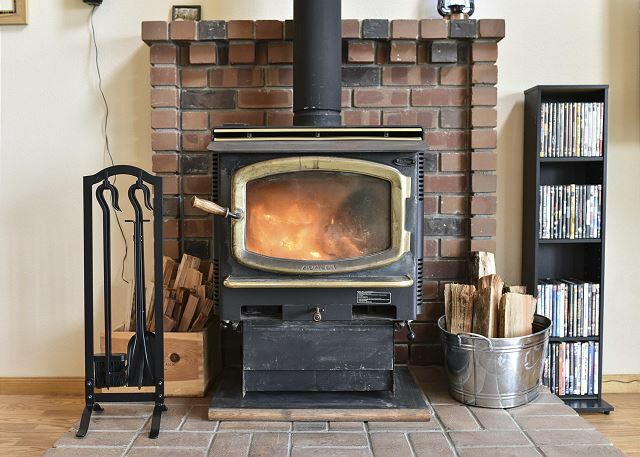 The only catch is that you must bring your own firewood; otherwise the wood stove is just for decoration. 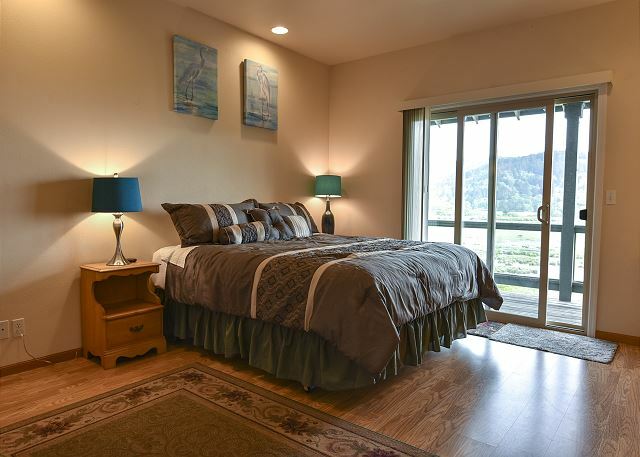 We are glad you spent your winter respite in our wonderful Oceansong Overlook home. 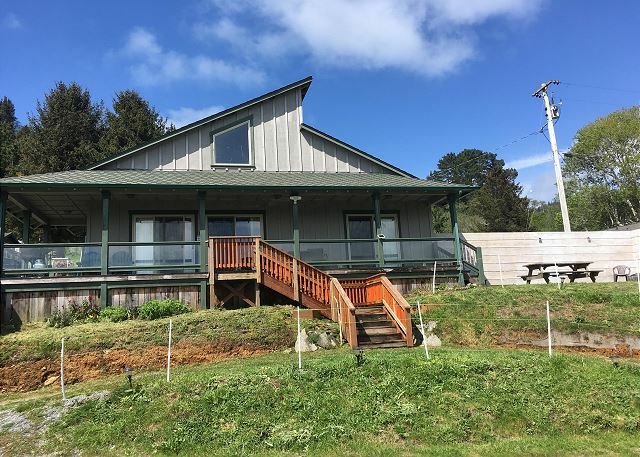 Just off the beaten path, off 101, this home provides the perfect location to enjoy nature and the beautiful scenic surrounding areas. We do hope you will return to visit us and thank you for recommending us to others. If you're looking for a remote location off the beaten path, this is it. An ocean view, horses and cows grazing in the distance, llamas, quails and numerous other birds greeting you every morning...who can ask for more? The cabin is modern and spacious. The beds are comfy. Loved the wood burning stove. Unfortunately, the heat was turned off prior to our arrival with no instructions on how to turn the radiators back on. So the cabin was cold our first night even with a fire in the wood burning stove. Directions for the radiators should be added to the cabin's book and nightlights are needed in the bathrooms and near the loft ladder. Other than that, the cabin is great. We thoroughly enjoyed our stay. Thank you for staying at the Oceansong Overlook. We are glad you like the home and the wonderful animals within the area. We are sorry to hear you were cold and had issues with the heating. 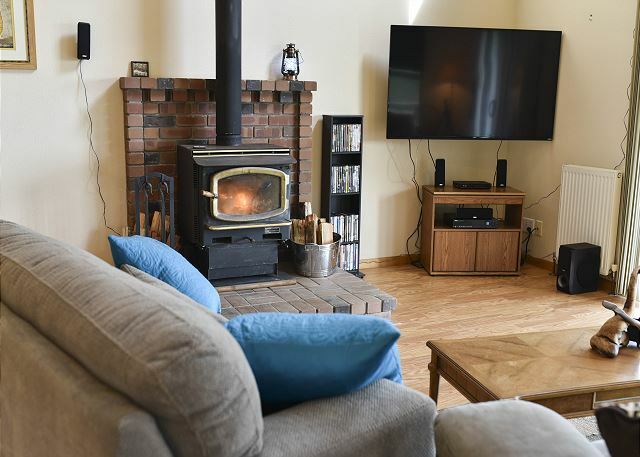 The heat was turned on to 60 in the afternoon prior to arrival, and the instruction binder in the home referred guests to the thermostat in the hall for use to turn the heat up and down. We did receive calls and emails, and the caretaker was contacted to pay you a visit. It appears that the heaters were turned off at the units themselves, of which we do not instruct anyone to do, therefore the thermostat would not work. Once they were turned on, the heat worked just fine. In the worse case scenario, there is a written on/off direction arrow on the units themselves, too. We do hope that despite the minor issue, you will return to pay us a visit again. This place is a wonderful home base while exploring the surrounding Redwood forests and cute coastal towns. It was a clean, relaxing and peaceful home. The place seemed bigger than the pictures depicted. The Oceansong Overlook is such a great house, I am always thrilled when our guests enjoy the home they have chosen. This house is definitely very relaxing and peaceful, and in such an amazing location. It is a wonderful homebase for visiting the redwoods. Nestled into a hillside along the southwestern border of Redwood National and State Park, Oceansong Overlook is the perfect place to unwind, relax, and enjoy some peace and quiet. 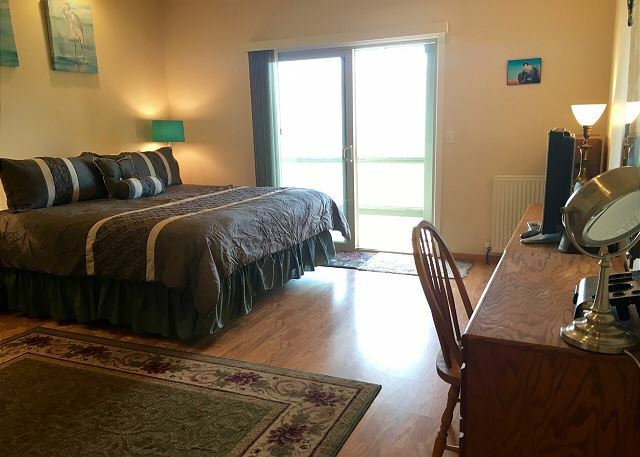 Oceansong offers spectacular views of Freshwater Beach, and Redwood Creek as it spills into the Pacific ocean, as well as horse/cattle pastures, and the hills surrounding Orick, the small town located just south of the park. 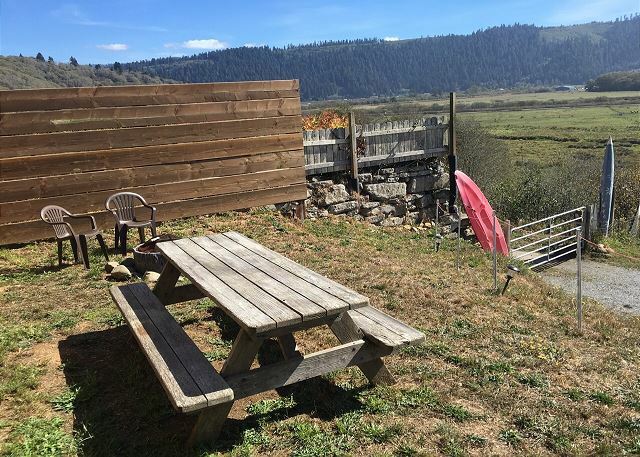 Living nearby in Trinidad/Patrick's Point area, I knew this would be the perfect place for my family to stay while visiting California and Humboldt County for the first time. They were not disappointed! 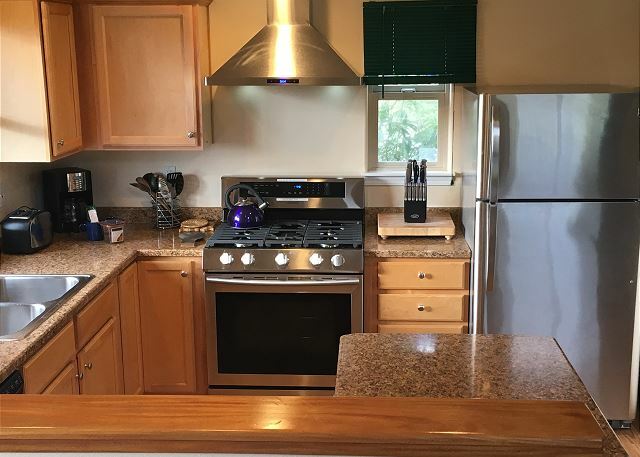 The rental is spacious, clean, and has all of the modern amenities, like a new range/oven, refrigerator, propane grill, big screen smart tv, wood burning stove, washer/dryer, and dishwasher. The owner, who lives nearby, was very kind and helpful, making sure we had everything we needed to make our stay comfortable. Lots of fun stuff to do nearby too! We did a few hikes, walked on the beach, went on a road trip north to Jedidiah State Park, and south to visit the nearby towns of Arcata and Eureka. You just couldn't ask for a better place to stay! I would recommend this slice of heaven to anyone looking for a quiet, relaxing, home away from home, while visiting the area! Thank you so much for taking the time for such a wonderful review of the Oceansong Overlook. It sounds like you all had a great time and really were able to enjoy the area to its fullest. Thank you for choosing this house and we hope we can accommodate you again in the future. We had a great stay at the OceanSong Overlook house is Orick, CA. It is in the perfect location for visiting Redwood National and State Parks. The house was very clean upon arrival and was everything we were expecting based on descriptions! Gorgeous view of the ocean, quiet area, and new amenities. Would definitely recommend to anyone and would stay there again if back in CA sometime! The Oceansong Overlook is a wonderful home with gorgeous views overlooking pastures and distant ocean. A little off the beaten path, providing a true feeling of getting away. We are pleased to hear that the home was a good fit and that you had a great stay. We do hope you will return to visit us again soon. Breathtaking at the end of the world. Outside of the house may need to be refreshed but you open the door and all is new and perfectly clean. Beds very comfy. One morning we waked up with mist giving the ambiance, next one a nice sun shinning: wonderful view. The Oceansong Overlook is a unique rental. It is definitely off the beaten path, but once there, it is so relaxing. Thank you for the review and for sharing your experience with us. We hope we have the opportunity to accommodate you again in the future. 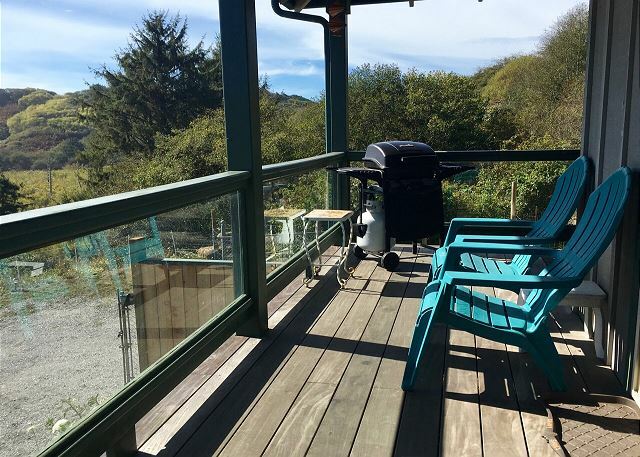 If you're looking for a serene well kept home along the coast of the Redwoods, this OceanSong Overlook is for you. We spent 3 nights here while exploring the Redwoods. We were lucky enough to speak with the caretaker; she was able to recommend a gorgeous hike in the Orick Area. Whatever you do, don't miss the Trillium Falls Trail; the scenery absolutely took our breath away. Can't say enough good things about the location (overlooking pastures of horses and cattle, as well as the ocean waves and forested hills) and feel of this area. Such a unique spot to stay. So off the beaten path, yet really not that far from 101 to get to the redwoods. This home is quickly becoming one of our popular destination houses. So glad you enjoyed your time here. We were very lucky to find this place without much notice when our kids got sick and couldn't camp. The beds were comfortable and the kitchen had everything we needed. The Netflix on TV was very nice with two sick kids. The ocean view is beautiful and our kids loved the animals nearby (horses, dogs, llamas!) Once we were all healthy it was very easy to get to the Redwoods state and national parks. The breakfast place nearby was great too. Our first impression was clean,enjoyable, and a feeling of home. Its a wonderful place to stay all day or plan trips to all the surrounding parks. You will here the Pacific from the front porch while you watch the horses run. The fog rolling in and around the valley. Its comfortable with a feeling of seclusion. I love this location and I am so glad that you did, too. The OceanSong Overlook is so different from many of our other rentals. Thank you for choosing this home and please visit us again in your future. This quiet house is located less than a mile down a gravel road to a long stretch of beach, which we had to ourselves. In the morning, it's almost magical with the mist hanging over the coastal trees. At low tide there are pools among the rocks holding anemones and other sea critters. 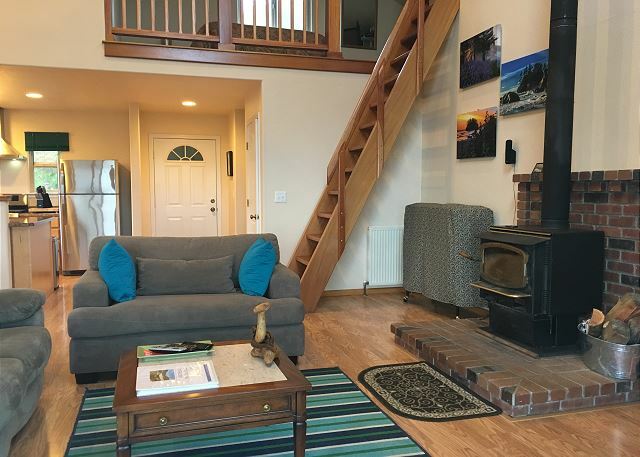 The property is just a few minutes from fern canyon (go in the morning to avoid the cars driving up the narrow road) and the Prairie Creek/Big Tree trails, which are a must. Be sure to pick up plenty of groceries in McKinleyville (the coffee maker takes basket filters). We ate dinner twice at the Trinidad Bay Eatery and enjoyed it. What a great review of the OceanSong Overlook. All I can really say is that I hope you will return to visit us! Property was awesome! Views were great, there is a little beach that is extremely secluded right down the road. Great location as well! Out of the way of the hustle and bustle but 15 min away from everything we came to California for. We are already planning a return trip! Thanks for a great experience! Happy belated birthday! So glad to hear that you enjoyed the Oceansong Overlook. I, too, love that it is off the beaten path, yet still near so much of the scenic areas so many come to see. We can't wait for you to return and visit! First, the pictures do not do this location justice. It is NOT on the highway, nor is there any noise from the highway. 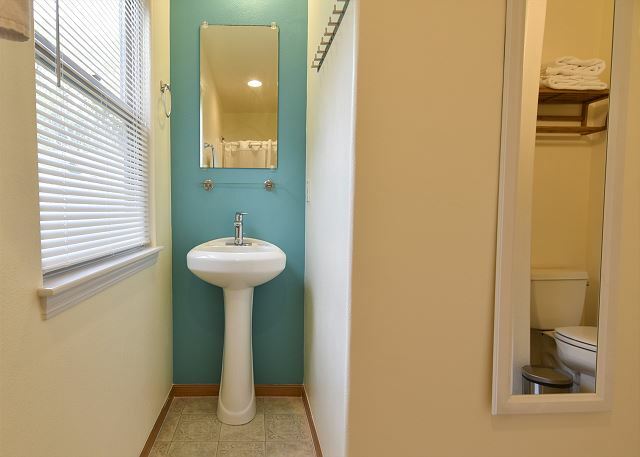 This was arguably the cleanest VRBO we have ever stepped into. Don't be discouraged as you wonder your way back to the house, it is in great condition and well kept. It is a little tricky to get back to, but a great spot with a view of the ocean (you can even hear the waves when they are a little bigger). The negative post about the birds is referring to the upper window which isn't really one you spend time looking out of. All ground floor windows were clean and clear. They birds make it so you can sit outside at night and enjoy a glass of wine while staring out at a nice valley (with the ocean in the background) without getting eaten alive by mosquitoes. As a MN resident, this was a pleasant surprise! I love the Oceansong overlook and I am glad to hear you enjoyed the home, too. For many, it is such a treat to be off the beaten path and away from the hustle of everyday city life, so thank you for mentioning that there isn't noise from highway or anything else. We did almost name this home Birdsong, because of the birds, but I do feel like they are part of the overall experience at this home. Thank you for visiting all the way from MN, and we do hope you will visit us again. We loved our 3 nights at this beautiful property. The views are amazing, the beach nearby is almost empty, great location for hiking in Redwoods National Park and in J.Smith Redwoods State Park. Very comfortable with everything we needed to grill, enjoy the firepit outside, and cook when we wanted to. Would definitely recommend it to anyone who wants to enjoy the Redwoods area. Thank you for choosing the OceanSong Overlook and for booking with Redwood Coast Vacation Rentals. 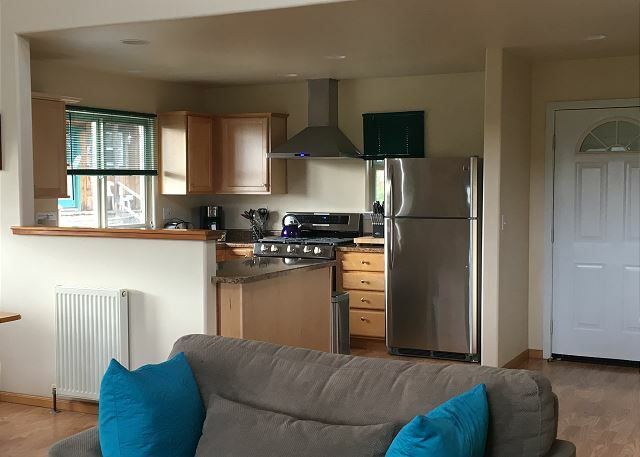 What a great property to stay in while visiting the Redwoods National Park and Jedidiah Smith State Park. We do hope you will visit us again and see more of our beautiful area. This is a great spot. The home is beautiful itself, and the view is magnificent. The Redwoods are close by, lots of parks to visit. It's quiet and lovely. Kind of wish I was back there. Thank you for choosing the OceanSong Overlook and booking with Redwood Coast Vacation Rentals. We look forward to accommodating you again in the future. We had a lovely time at Oceansong Overlook! the locals were very friendly, we had access to a lovely beach, and had a great time exploring with lots of help from all of the information at the house. 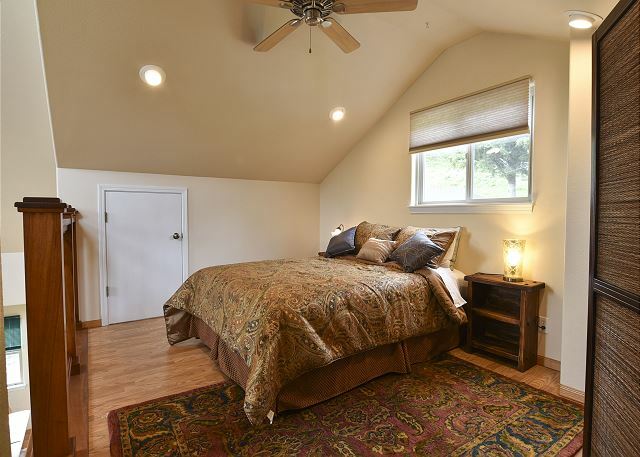 The house is very comfortable and has excellent furnishings. Would recommend this place to all who want several days with a great ocean view and access to the coastal redwoods. Thank you for sharing that you had a lovely time at the OceanSong Overlook. Such a wonderful home with such a unique location; glad to hear that it was a good fit for you and your family. 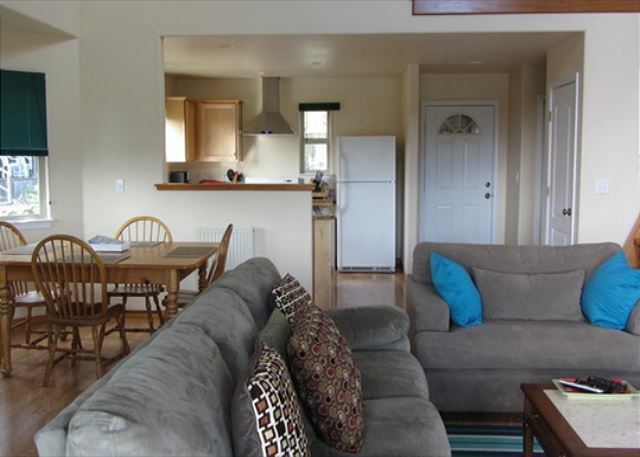 Again, thank you for booking with Redwood Coast Vacation Rentals; we hope we can accommodate you again in the future. The location of this rental exceeded our expectations. The house itself is charming and had everything we needed/wanted. We will definitely go back and I have already recommended to other friends. The Oceansong home is in such a unique location, I am pleased to read that it exceeded your expectations. Redwood Coast Vacation Rentals thanks you for your stay and we hope you will return to visit us again. Pleasant weekend trip! Lovely place! We had a great time. Loved the place, location and everything about it. Very cozy place with a fireplace, wood being provided made it easier for us. There was ample linen, sheets, comforters, towels for my guests and me. Special shout out for putting out cookies, coffee for us. Convenient location to all the redwood parks and beaches around. We thoroughly enjoyed our stay and would love to come back! Thanks for the review Rupal! The OceanSong is one of our unique rentals, off the beaten path with amazing views. It is definitely cozy and lovely. So glad you enjoyed the local treats we left for you. We have so many great companies in our area providing some of the most wonderful things. Again, thank you for stay and please come back and visit again! A lovely retreat close to great hiking in Redwood country. The house is perfect with everything you could want or need. Very comfortable, quiet, and peaceful! OceanSong Overlook is just that; very comfortable, quiet and peaceful. Once of my favorite rentals, I always feel like I am a world away when I go there. I am so glad you enjoyed this unique place and hope you will visit again. To think that we nearly didn't rent this house because it had only external photos and no reviews earlier this year - we'd have missed a real treat. OceanSong Overlook is modern, light and airy. We were delighted to find it was well-maintained and very comfortable. It has everything you need for a long or short stay. It was warm while we were there in July but we could imagine it would be lovely and cosy in the winter too. The huge windows allow you can watch the weather, the changing light and the amazing bird life around the property and in the estuary. We could even see grey whales in ocean. Its absolutely fantastic for lovers of wildlife and peace and quiet. The beach is a short ten minute walk and when you get there it is clean and deserted. We watched whales, porpoises, seals and amazing flying displays from resident pelicans as we sat opposite the Three Sisters. The house is also close to Prairie Creek Redwoods National Park where we did an eight mile hike on the well signposted paths. You never stop being amazed by those trees. We also visited Humboldt Lagoons State Park and Trinidad which were also great but it was lovely to return to the OceanSong Overlook and the nearby beach. If we lived closer we'd definitely visit again ... but sadly its a long way from the UK. 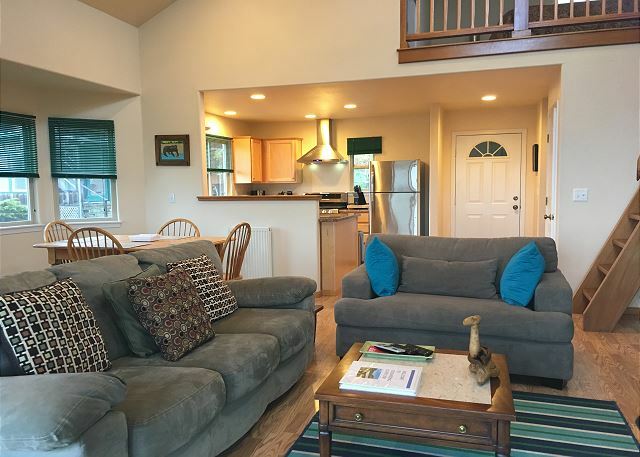 The agents at Redwood Coast Vacation Rental were great too when we made our booking and need to sort out a few details. So,all in all, we'd thoroughly recommend this property. Wow, what a great review! you really captured this place perfectly. I love this place for everything that you have mentioned. You must have booked when we were first listing the home and we hadn't quite had the interior photos completed yet. So glad you booked it! it takes special people to appreciate this location of our north coast and all the wildlife and nature we have around us. This home is also idea for those seeking the Redwoods and local area attractions, as well. The UK is a little far, but we do hope you will visit us again. Thank you for choosing the Oceansong Overlook and staying with Redwood Coast Vacation Rentals. Love that you enjoyed the OceanSong Overlook! Such a great place! Thank you for your recent stay and I hope you will get a chance to visit again.